Randle brings his extensive experience and knowledge to his own wines for the Calafia Cellars. 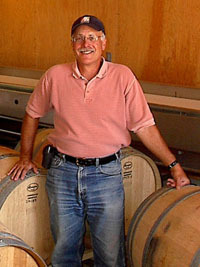 A native Californian, Randle attended the University of California at Davis graduating with a M. S. in Viticulture in 1974. He worked as a viticulturist for the original Souverain Winery, and learned the practical aspects of winemaking from their winemaker, Phil Baxter. Randle worked with the Napa Valley microclimates as a vineyard manager and cellar master of Mayacamus Vineyards. He has honed his wine making skills as the winemaker for Stags’ Leap Vineyard, and as a special projects manager creating exceptional wines from Mt. Veeder Mountain grapes for the Hess Collection. Randle makes the wine, MaryLee does everything else! The winery name derives from legend about a queen and her society of amazons on an island in the West Indies recorded in the log of Columbus’ first voyage. The legend was then popularized by Garcia Ordonez de Montalvo, a historical novelist, in his book, published in 1503 in which he named the queen “Calafia.” The origin of the word “Calafia” remains a mystery. Explorer Hernando Cortez landed near the tip of Baja in 1513 and was reminded of the rugged terrain described in Montalvo’s book. Believing he was on an island he named it “Calafia’s Land” which became California. Queen Calafia’s great wealth was guarded by griffins; half eagle, half lion. We use griffins in our logo, protecting the fruit that vines and land bear.